We’ve had to do a bit of sheep maintenance recently. We’ve wormed and feet-trimmed this year’s lambs, moving them onto fresh pasture a couple of days later, once any worms had been passed. Doing the same for the other group—the ram and his five ewes—was rising in priority up the “List of Things to Do”. This would involve a move onto fresh pasture after worming. The field the lambs were on was looking a bit threadbare and so they needed moving too. Added to which, I wanted to take the ram away from the ewes and put him in with his sons for the winter. A sheepy logistical conundrum. Why move the ram? He maybe macho but he’s no gentleman and whilst he “protects” his ewes from me, he’s sure to get his nose in the feeding trough first, robustly bustling the ladies out of the way. As their sheepy pregnancy advances, I assume they become a bit more delicate, so we like to take him away. There’s also a strange thing where, when it’s raining, one ewe always gets excluded from the shelter and ends up having to hide from the worst of the weather round the leeward side. They would be better off without him. Although we’re in our third year of keeping sheep, I’d still class us as relative beginners, and I was wary of making a mistake, being too eager to take the ram away from the ewes, i.e., before he’d put them in lamb. We phoned Renée to ask her what the gestation period of a sheep is. It’s about 5 months. She went on to say that a ewe’s menstrual cycle is 3 weeks but they’re receptive for a very short time. So I checked the birthdates of this and last year’s lambs. Around the beginning of March, which means the woolly jumping took place back at the beginning of October, which made our decision for us. The next issue is catching them. We don’t (yet) have sheep hurdles and had an enclosure at the end of one field where we’ve managed to coax them in many times before, sneakily closing the gate while they had their noses in the sheep nuts. But they’ve been getting ever more wary of this. Gabrielle and I had tried unsuccessfully and knew we needed help. Paddy used to be a shepherd on the Cumbrian fells and his grey-whiskered mate Scruff, used to be a Cumbrian fell shepherd’s sheepdog. We called Paddy and Scruff. 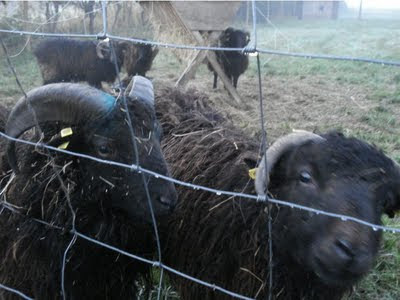 Now Scruff has encountered our pint-sized black Ouessant sheep before and didn’t really know what to make of them, much to Paddy’s embarrassment. Well, he’s made amends and while Paddy reckons this retired chap has lost the instinct to close in and finish the job off, he did enough to successfully round up our miniature flock of miniature sheep into their pen to allow me to deal with medicine and toenails. It was a tear-in-the-eye treat to see man and dog working together in our very own field. I’m sorry I haven’t any photos to mark the occasion as I was rather occupied in snappy gate-closing duties but we do have a pic of Scruff out for a walk when we looked after him for a weekend recently: handsome chap! The ewes are definitely happier now in their women’s-only paddock but the same could not be said of the boys. Despite the fact that the male lambs have been veterinarily disconnected from their testicles, they retain enough masculinity to be up for a fight when a new bloke turns up on their patch (even if he is their dad). The aftermath of their initial getting-to-know-you party bore an uncanny resemblance to pub kicking out time on the Kilburn High Road on a Saturday night. I spot painted their cuts and black eyes with blue antiseptic spray and, thankfully, they seemed to have settled down nicely now (see photo below). Usually once castrated horn growth should be almost nothing ot very feeble and short.....Now that lads set look like those that would be found on a lad with something extra!! !.....or is he a new ram?? ?